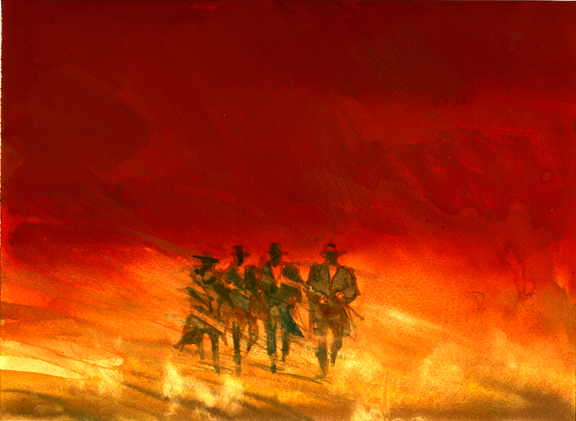 Went home for lunch and grabbed a painting out of the morgue that I thought could use a tweak or two. 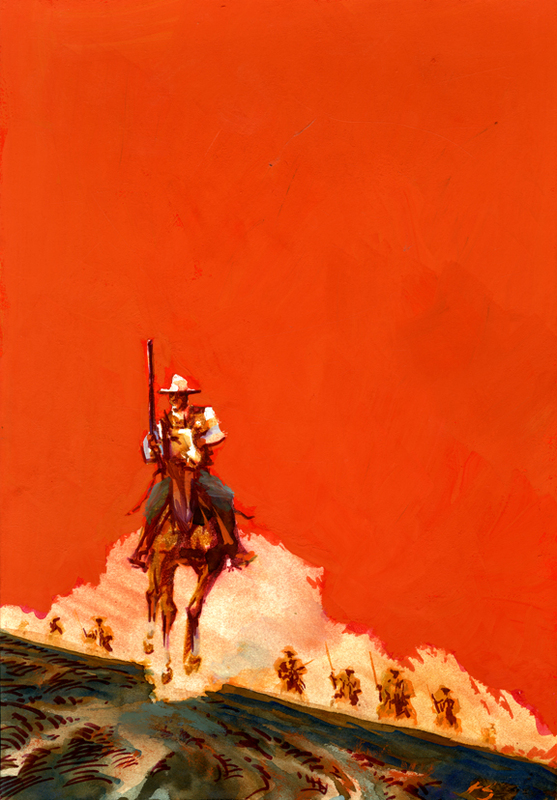 Daily Whip Out: "Texas Rangers On The Move"
I love those guys and the brutal world they rode in. Not the most politically correct position, but hey, sue me. The model for this image was Dave Daiss who rode his little pony up Ocotillo and into his driveway at a fast clip. The irony here is he looks like John Wayne. Wasn't supposed to be, wasn't even trying, but sometimes you start with Dave Daiss and you end up with The Duke. It just happens. "Write a story where your real love and your real hatred somehow get onto the paper." Would it change your opinion of the Tombstone street fight if you knew the McLaury family called him Tommy? Or, that Tommy and his brother Frank were leaving the next day to attend their sister's wedding? Daily Whip Out: "Walkdown Second Thoughts." Would it change your opinion of Doc Holliday if you knew he gave both barrels of the Wells Fargo shotgun into Tommy McLaury, who was unarmed? Daily Whip Out: "Doc Holliday Fades"
And would you think differently about the Earps if you knew one of them was gay? 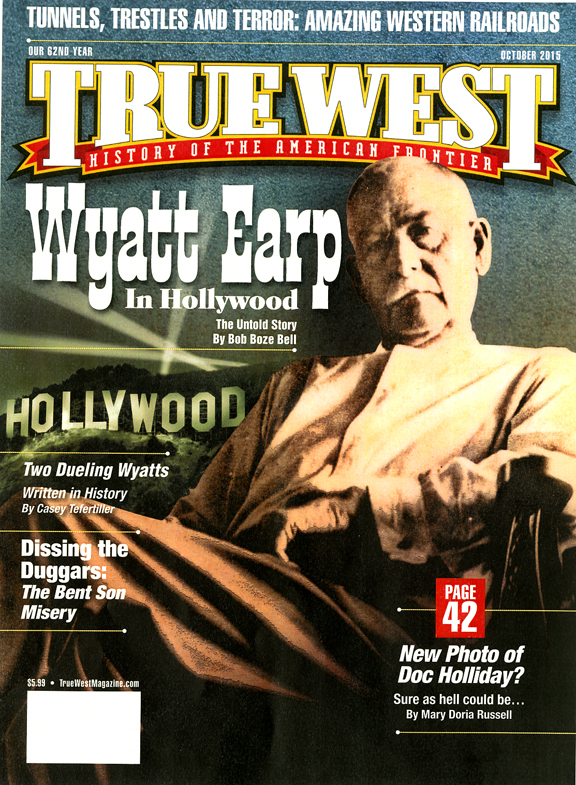 Daily Whip Out: "Wyatt Earp And His Younger Brother Warren"
Only if you have a heart. "To understand all, is to forgive all." I think it's safe to say Wyatt Earp would hate me. I'm part of the press, or, as he might call it: media scum. 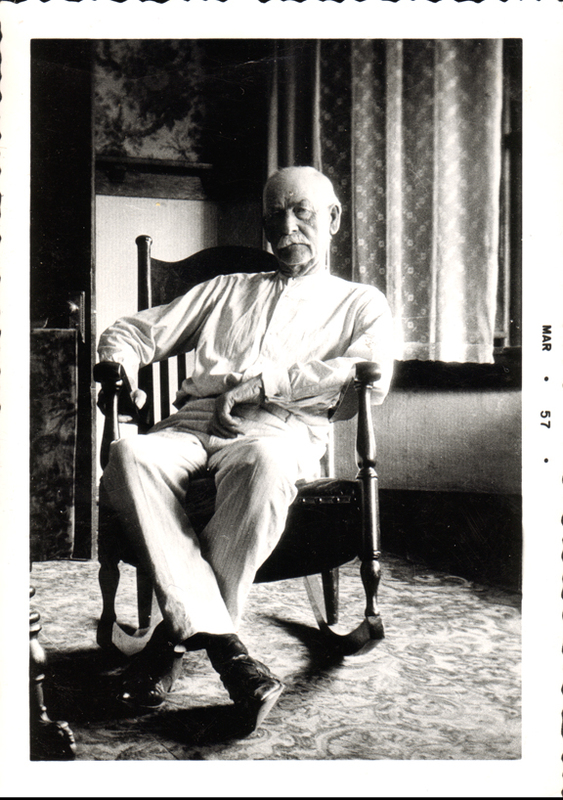 If you don't believe me, look at how disgusted Wyatt Earp is in this photograph from the 1920s. The truth is he had good reason to be angry. For one thing, he hated the press, especially after what they did to him after the infamous Sharkey-Ftizsimmons fight in 1896. That was in San Francisco and Earp was the referee in a heavyweight fight where Earp called a foul on Fitzsimmons and threw, or, ahem, awarded the purse to the underdog, Sharkey. The newspapers had a field day calling it a fixed fight and calling Earp a crook. From Wyatt's point of view, they printed lies, they never did fact checking and they had no shame. You can see the disdain in his eyes 30 years later, and you can almost hear what he's thinking: "You're not going to dredge up a bunch of crap about my life once again, are you? And then print it in some damned rag?" Well, yes we are, but with all due respect, Mister Earp, we did extensive fact checking, everything is totally true and we actually have some shame issues, just not on this subject. "Pretty much all the honest truth telling there is in the world is done by children." 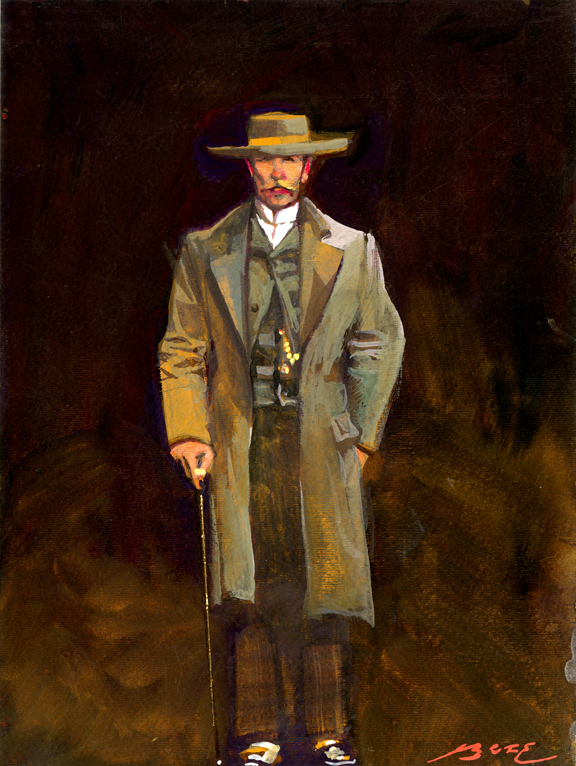 Finishing the big Wyatt Earp In Hollywood opus this morning. 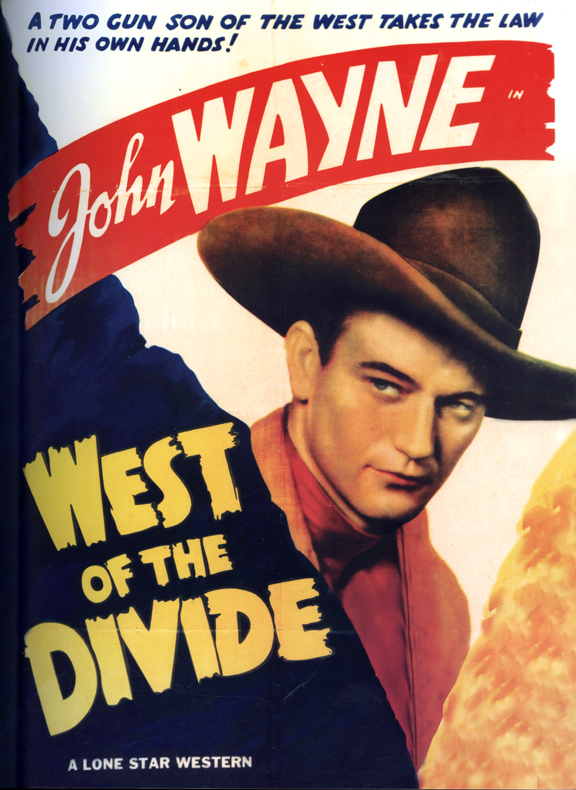 Since I'm dealing with the movie outlaws in the last outlaw town (Hollywood), one tidbit I am trying to shoehorn in somewhere is the Jack Warner comment to John Wayne, after The Duke's Batjac Production Co. ran into financial difficulties: "You really ought to bring Batjac back to Warner Bros, Duke. You should be here, where you can be f---- by friends." If you want to understand Hollywood, that says it all. "Wayne got into a beef with [Jack] Warner about the costs of a picture Wayne had made; Warner's hung us on that one too. Warner's promptly threw away the rest of the pictures. . .we got a good screwing, because of the way Warner's released the picture." —William Clothier, who photographed a Batjac production of "Good-bye My Lady" which cost $900,000 and had world rentals of $677,000, and with Warner's creative book keeping the film showed even more of a loss. Both quotes and the above information are from the excellent book "John Wayne: The Life & Legend" by Scott Eyman. I highly recommend it. When I was a kid we used to go out to Goldroad, a ghost town not far from Oatman. 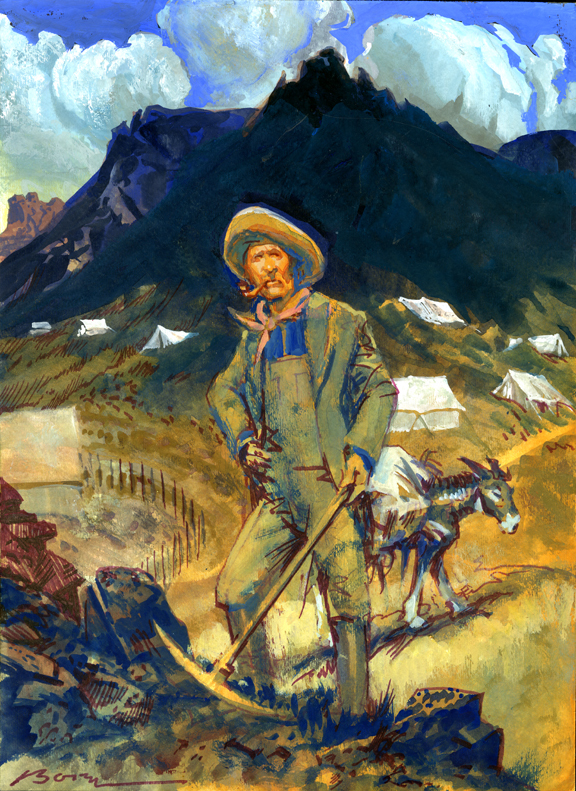 I never could find a connection to anyone famous that worked or lived there, until last week when I found out John Flood's lifelong partner, Edgar Beaver, worked in a mine there. 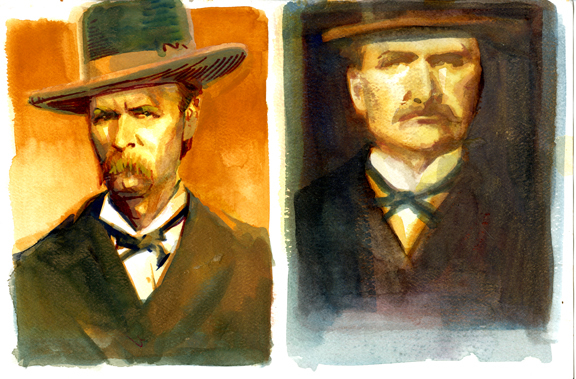 Three degrees of Wyatt Earp! Daily Whip Out: "Goldroad Prospector."